True Story: How To Write A Query Letter For A Memoir - Writer's Relief, Inc. Writing a memoir can be difficult. Writing a query letter for a memoir? That’s a task so rife with conflict, emotional obstacles, and drama that you might be able to eke out another chapter to your memoir from the experience! But don’t worry. Our submission strategy experts here at Writer’s Relief have been helping authors write query letters for memoirs since 1994. 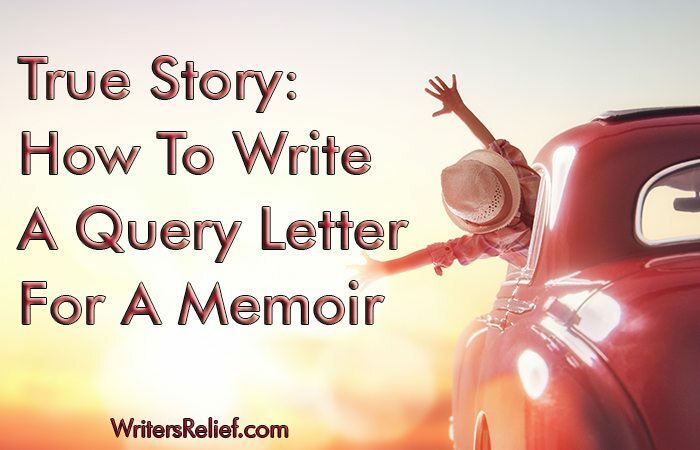 And our simple, effective tips will help you write a query letter for a memoir that will have literary agents wanting to know more about you and your unique life story. Write a great first line. We’ve talked a lot on our blog about how to write a killer first line for a query letter. Start strong! Choose the right POV. Memoir writers often struggle with POV in memoir. “Should I write my query in first person? Third person?” In most cases, a query for memoir is best written entirely in first person. Why? Because a memoir tells the true story of you. And unless you regularly talk about yourself in the third person, your memoir query should capture your authentic voice. Use the correct verb tense. A good query letter for a memoir tells a story in a natural way—just like the way you would tell a true story to an intimate friend. And so while query letters for novels often feature book blurbs in present tense, we recommend that the synopsis portion of a memoir query should be in past tense. Your query mimics real life. Know your genre. If you’re hoping for a massive book deal via a reputable literary agent, it can help to know the market, to see how other memoirs are positioned, and then, to use your query to highlight those elements that make your memoir unique and emotional. Remember the “uplifting” factor. Many breakout memoirs dwell on moments in a person’s life that are especially challenging—after all, the bigger the obstacle, the more emotional the reward. If your book tackles especially difficult material, consider trying to focus your query on the good things that came out of a bad experience. Learn more about factors that can affect the salability of your memoir. Cultivate a strong author bio. If possible, try to publish short excerpts from your memoir in magazines and literary journals prior to sending your book query to literary agents. Great publishing credits demonstrate that there’s existing interest for your work and that you are a skilled writer. My memoir is mostly true, but I’ve changed names and also added a few plot elements that didn’t really happen. Is that okay? Sure it’s okay. It’s your book and you can do anything you want. But if you’ve added in a love interest, an exploding car, or any other plot device that didn’t actually happen, then you’re not really writing a memoir anymore. Learn more about how to deal with books that straddle the line between fiction and nonfiction. I heard that only famous people are getting memoirs published these days. Is that true? Nope. Not true at all. Being famous obviously helps get a literary agent to be interested in your query letter. And we all know there are plenty of celebrity memoirs that, frankly, aren’t really worth reading. But even if you’re not famous, your memoir query letter might have a shot at securing interest if you have a compelling story to tell. It’s the story that matters most! QUESTION: What’s your favorite memoir? Agents aren’t usually receptive to photos accompanying the query letter. Initially, they likely just want to know a little bit about yourself and the book you’re querying. I will begin querying agents to represent my autobiography. Are agents receptive to photographs accompanying the query letter? Some events in my unorthodox life could be mistaken for the fabrications of an imaginative author without photos to substantiate the accounts. The Glass Castle by Jeanette Walls. It was real and made me laugh.